JACKSONVILLE, Fla. - Jacksonville Jumbo Shrimp Director of Community Relations Andrea Williams was recognized Thursday during the 30th annual unveiling of the Jacksonville Black History Calendar at the city's Main Public Library. She will be highlighted in April in the 2019 calendar, which can be picked up for free at any of the library branch locations. The Jacksonville Black History Calendar was started in 1989 as a means to highlight local African American contributions to Jacksonville. The annual calendar originated in 1989 through the collaborative efforts of the late Clovia Russell and Dr. Brenda R. Simmons-Hutchins, who each had idea to present biographical sketches of African-American citizens who had contributed to the growth and development of the city. Featured honoree selections are influenced by the National Black History Month theme presented by the Association for the Study of African American Life and History, which for the 30th Jacksonville Black History Calendar is dedicated to Black Migration. "I am completely humbled by this entire process. Jacksonville has wrapped its arms around me in such a loving manner, and for that I am grateful and honored to serve this community," said Williams. "I pray my service honors my beautiful African American ancestors, who had to serve with honor and humility sometimes under much more duress than I will ever fully understand. "I am thankful to my sorority, Zeta Phi Beta Sorority, Inc., for nominating me and Harold Craw for his continued support. We started this journey in Jacksonville together, and I am thankful for his leadership, mentorship and friendship. I would also like to thank Dr. Brenda R. Simmons-Hutchins and her staff. Congratulations on the 'Pearl' edition of the 2019 Jacksonville Black History Calendar, and I am extremely humbled and thankful for this recognition." 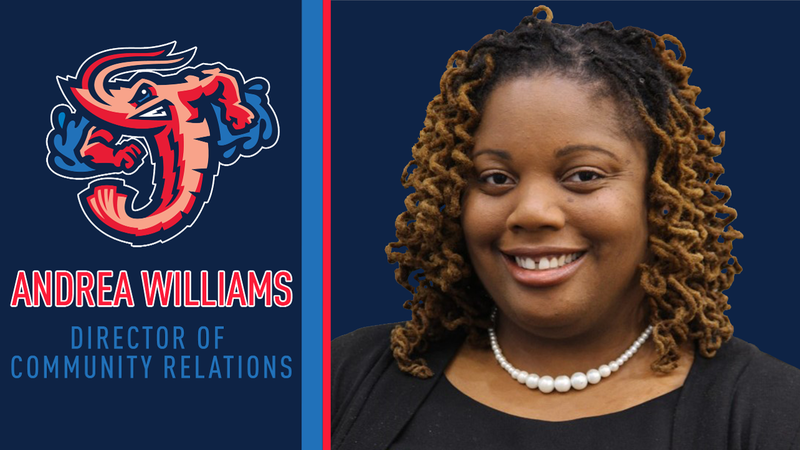 A native of Davenport, Iowa and Valdosta, Ga., Williams joined the Jumbo Shrimp in 2015 as the club's first African American Director of Community Relations. Through her role, Williams leads the Jumbo Shrimp's community involvement program in the greater Jacksonville area and surrounding counties by overseeing player, mascot and staff appearances, ballpark tours, non-profit fundraising, reading programs, company donations, volunteer opportunities and the club's corporate care program, through which businesses may donate tickets to non-profit organizations. "Andrea is an indispensable part of our Jumbo Shrimp team," said Craw, the club's general manager. "Her efforts to improve both the city of Jacksonville and its surrounding counties have touched so many of our friends, family and neighbors. The work she has poured into this area and her humility while doing so is a model in Minor League Baseball for how teams can improve their communities." A graduate of Valdosta State University, Williams serves as a mentor and participates in the Diversity and Inclusion programs hosted by Minor League Baseball. She holds membership in four organizations dedicated to improving the community: Zeta Phi Beta Sorority, Inc., Alpha Omega National Service Fraternity, Order of the Eastern Star, PHA and Daughters of the Imperial Court. A member of the Jacksonville Leadership Class of 2019, Williams has had the honor of helping homeless veterans, mentoring young women and partnering with Habitat of Humanity Jacksonville. Her trailblazing career began as the first African American woman to be named Director of Ticket Operations for the Quad Cities River Bandits (Class A Midwest League) before she moved on to work for the WNBA's Atlanta Dream.